Knowledge is power. Having the forms and access to the relevant case law is essential to success. Strengthen your emerging talent by educating them about their careers and providing them with the tools to succeed. Our mission is to provide dedicated support, education, hands-on guidance, and industry-leading materials to our members to assist their staff in optimizing their business practices in the area of credit and collection. Procedures, compliance guides, checklists and discussions of business practices addressing the actual situations encountered when working as an attorney, creditor, banker, or other player in the credit and collection industry. CCEF offers a comprehensive 30+ page letter compliance memo with dozens of letter templates to help you achieve your clients’ goals while remaining compliant with the law. CCEF will develop, organize and maintain a comprehensive directory of all the businesses that you are likely to use in this industry: law firms, collection agencies, software companies, skip tracing, and others. CCEF provides education services and NOT legal advice. You should consult with an attorney if you are seeking legal advice. The 2016 Edition of the The Complete Guide to Credit and Collection Law is available now! Jay Winston is a dynamic and knowledgeable speaker when he spoke to the Kansas Creditor Attorney Association's CLE on February 15, 2016. He gave an extensive, exhaustive, and comprehensive overview of the #1 Demand Letters and Bona-Fide Errors Defense courses. KCAA is immensely grateful for Jay's enlightening presentation and superior knowledge of FDCPA. I thought the policies and procedures you provided for me were invaluable in attracting new business and getting approved by vendor management. I believe that my organization has the ability to grow because it sets us apart from the competition inasmuch as we are more organized and have a sense of sophistication. If you ever want to put together a committee of CCEF members to discuss and implement any other policies and procedures that will help our industry, please keep me in mind. Again, thank you. Jay, as I mentioned, this is the best money I spend. Jay, I have to say, CCEF is proving to be very helpful to me. The cases you send are exactly the thing need to see. Keep up the good work. Jay is very thorough and has an amazing knowledge of collection laws. I highly recommend him for letter reviews. he playbook for 2015 collection practice changes daily. CCEF keeps the professional in the game with daily national case reports and other professional member benefits. CCEF is not selling Snake Oil, but real educational services from an industry leading attorney. I would recommend this product for the collection practitioner to help them to grow the business, and not simply add to non-productive overhead. I just got a case dismissed in Florida because I read your email about an identical case that had just been dismissed. Your email was incredibly timely and was enormously helpful. Thank you! Davis and I agree that we are actually getting more out of CCEF than we thought we would! You do an incredible thing with your newsletters. The fact is that many of our customers treat your newsletter as a secret weapon that enables them to stay ahead of the curve. It is truly an amazing thing that you are able to condense decisions into such succinct terms that all of my team can understand and process without the proper legal education. It's easy to communicate "the new rules" with the team, but when they are able to understand why the new rules were put in place, it enables our organization to take a further step forward and prepare ourselves for issues that have not yet developed. We see what's coming because you explain so well what's happening right now. I am very happy with my membership in CCEF. They have done a wonderful job keeping its members up to date on current FDCPA cases and Consumer Fininacial Protection Bureau bulletins, laws and regulations. 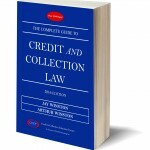 It is a great resource for anyone involved in creditors rights. The regular updates of important consumer laws and cases saves our firm a lot of time and money. Thank you for presenting at our meeting on Friday. Based on feedback from the attendees, your presentation was a highlight of the day. I enthusiastically support Jay Winston and the work that the CCEF is doing. He has vast knowledge and an incredible command of what is going on in the industry and the challenges that we face in our practices. As a solo creditor’s attorney, I greatly appreciate his genuine desire to educate and the ongoing support and peace of mind that CCEF provides. His letter review program is an absolute must! Jay Winston and CCEF provide a tangible and practical go to resource that any collection firm will find well worth the investment. I can only imagine the amount of time and money I have saved from membership in CCEF. I have been a member of CCEF for about two (2) years and I have their case law updates and instructional materials to be invaluable to me and my staff. It enables my Law Firm to keep up to date with trends and current developments. I would highly recommend CCEF to every collection firm in the industry. Jay Winston's CCEF has tremendously helped our law firm in the practice of collection law. In my own opinion I would have to say that the forum offers cutting edge information with regard to creditor's rights and consumer law. The CCEF has also been our firm's lifeline on numerous occasions. As opposed to the many other types of professional memberships that exist, the CCEF has paid for itself. Roosen, Varchetti & Oliver P.L.L.C. I met Jay at NARCA in DC and signed up with him to help with my letters. He is constantly updating me with cases and insights to avoid potential problems. He is an invaluable source of legal research and process improvement for small and mid-size ARM firms. My office has found the information provided to be very helpful. Frankly, I do not have the time to do all of the research that is provided. The regular updates and warnings have helped us with our clients and with our own internal handling of matters. I recommend the service to any attorney that handles consumer claims or has or represents collection attorneys or collectors. Jay Winston and CCEF are my favorite source of "breaking" case law, and his frequent emails on both good and bad decisions keep me posted on legal trends in California and the nation. I have and will continue to recommend CCEF to my friends and "friendly competitors. The daily e-mails with case updates alone are worth the cost of the membership. Relin, Goldstein & Crane, L.L.P. I appreciate CCEF's daily case law updates and succinct synopsis. Very helpful and easy to digest. CCEF's library of cases that are available upon request have helped me make better business decisions. Our membership investment has been money well spent! Membership is an excellent value. It is worthwhile to have this as an additional resource. We endeavor to stay ahead of the next trend and this will further enable our success....This is valuable. I just wanted to say that Jay Winston through his CCEF Group does an excellent job of reviewing all relevant FDCPA and TCPA cases and summarizing their main points. His letter review and other consulting services are also valuable.If you want to be kept comprehensively informed about important new case law there is no substitute for his services.The price of membership is quite reasonable.